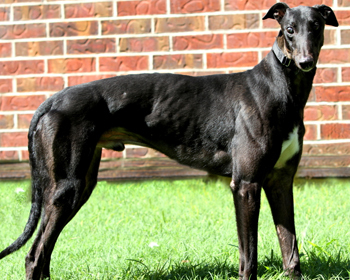 Captain is a handsome 1½-year-old black male born in May 2009. 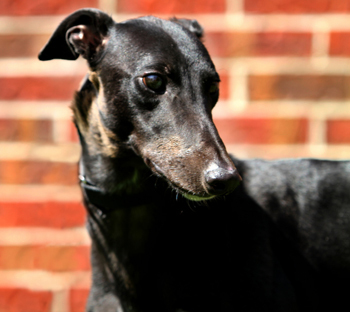 He is the "A" pup in the litter, and as such, Captain was not individually registered with the National Greyhound Association. Captain arrived with 3 other greyhounds - Arrow, Hunter and Sweetie - on September 21, 2010, from a coyote hunter in Amarillo. Captain arrived with an enlarged bulged right eye, that had suffered some kind of severe trauma. Dr. Jeff Ellis of VCA Preston Park Animal Hospital referred him to Dr. Robert Munger of the Animal Ophthalmology Clinic. On December 17, 2010, Dr. Munger removed Captain's right eye globe and inserted a black silicone sphere implant, known as an intraocular prosthesis, which is now barely noticeable visually. Captain has completed his recovery and navigates the house and walking outside beautifully. Future ophthalmic care will be minimal with bi-annual visits for rechecks. Captain is cat tolerant and has not yet been tested with small animals. Captain is a happy, affectionate boy who loves life, people, and dogs of all sizes. He is a very funny boy and quite the class clown. He loves to participate in any activity. Kongs are strongly suggested for his amusement as soft stuffies have a life expectancy of seconds around him. Captain learns quickly and is easy to train. He is house trained, crate trained and walks well on leash with his person on the good-eye side. He knows the commands: no, sit, down and kennel. Captain is ready and waiting for his new future in a fun, active forever home!